Learn how expert esthetician, Jane Mann built her hugely successful practice in this two-part training training course. You’ll get two 90 minute videos of Jane, with assistance from Dr. Darren Starwynn, as she shows you the 5 Most Important Elements for Building a Thriving Facial and Whole Body Rejuvenation Business. You’ll get her customized Intake Form along with detailed instructions for using it to plan your patients complete treatment program. The complete training package includes two 90 minute videos, the complete transcript of the entire training sessions and Jane’s customized intake form is available for a total cost of $67.00. To purchase the Advanced Facial and Whole Body Rejuvenation Training Package click on this link. Once the payment has been processed you’ll be taken to a page with links to the videos, transcripts and the intake forms. Vibration refers to oscillation, or back and forth movement – like a plucked guitar string or the pendulum of a grandfather clock. Each vibration has a frequency, or rate at which it oscillates. One of the primary ways we experience vibration is through sound and music – each tone is a different frequency. Application Brief #9110A WOUND HEALING ACCELERATION WITH THE ACUTRON MENTOR USING MICROAMP AND NARROW PULSE MILLIAMP CURRENTS submitted by Barbara Zentz, P T and Ken Wolf INDICATIONS FOR TREATMENT: Decubitus ulcers, slow healing wounds, septic or necrotic wounds, post surgical wounds, post-stroke necrotic areas, sports injuries. Less is More By Darren Starwynn, O M D We clearly live in a time on Earth when fresh solutions are needed for a myriad of pressing issues. One of the biggest ones is the need for more efficient utilization of natural resources. With human population now at 6 8 billion people and expected to reach 9 billion by 2040, resources are being increasingly stretched. We are all trained in a variety of techniques for assisting our patients or clients. What usually brings them into our clinics are their needs to look younger, get free of pain or to be relieved of the distressing symptoms of disease. Basically, most people want to be free to do what they want to do without pain, fatigue or dysfunction and want to look great in the process – with as little inconvenience as possible. I have written in previous articles about the power of treating holographic micro-systems, such as ear, hand and facial regions1 Each of these contains a map of the rest of the body. There is two-way communication between micro-system points and their corresponding body parts. Stress and dysfunction in the Liver, for example, can show up on the face through deep vertical lines on the brow (Liver area) or through discolorations in the Liver point of the ears. Our modern medical system offers many effective treatments for injuries, infections and lifethreatening diseases. Survival rates have improved for patients with heart disease and cancer. Yet medicine offers few viable answers for patients with degenerative neuro-muscular conditions such as multiple sclerosis (MS), Lou Gehrig’s disease (ALS) and Parkinson’s. The method detailed in this article has been used with significant effectiveness to support and help heal patients presenting with multiple sclerosis, Parkinson’s, ALS, fibromyalgia and other degenerative conditions. This method of autonomic nervous system regulation is a direct application of what is commonly called vibrational energy medicine , or VEM for short. There is quite a bit of controversy among light therapy proponents about the therapeutic value of lasers, which produce coherent light, versus LED and incandescent sources, which produce incoherent light. Laser enthusiasts, backed up by a large body of research, claim that only the intense, highly coherent beam of a laser can penetrate deeply into the body’s tissues and meridian system for significant results. For those of us in the healing arts, it is useful to take a step back from day to day practice and to ask ourselves what “healing” really is all about. When a patient has a very positive, long lasting response to your treatments, what really has taken place? Or if patients don’t get much better after receiving well-chosen techniques, why is that? Most of what we have been taught offers only very limited explanations for the phenomenon of healing, or lack of it. 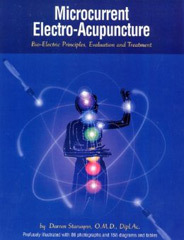 How To Combine Needling and Non-Needle Microcurrent Electro-Acupuncture By Darren Starwynn, O M D I have been an advocate for teaching non-needle electro-acupuncture skills using microcurrent for many years, and my many articles in this publication have explored manifold aspects of this specialty. One of the biggest motivators bringing new patients to acupuncturists is pain. Acupuncture has a wellearned reputation for effective pain relief without drugs, in many cases, when other methods fail. Yet even traditional acupuncture has its limits – and this became apparent early on in my practice. Global warming, which is increasing in this new century, is precipitating the spread of disease epidemics in areas unprepared for the diseases, say many health experts world wide. Warmer climates are allowing greater numbers of ticks, mosquitos, mice and other disease carriers to survive longer and to expand their ranges. Laser and LED Treatments: Which Is Better? There is quite a bit of controversy among light therapy proponents about the therapeutic value of lasers, which produce coherent light, versus LED and incandescent sources, which produce incoherent light. Laser enthusiasts, backed by a large body of research, claim that only the intense, highly coherent beam of a laser can penetrate deeply into the body’s tissues and meridian system for significant results. Pain is a severe phenomena, a decidedly unpleasant set of sensations that motivates us very strongly. It is estimated that Americans spend over $100 billion a year for dealing with all aspects of pain, including medication, therapy and lost time at work. According to Western science, pain is associated with the mechanism of complex interrelationships in the nervous system. The Power of Intent, Part Two: Excellent or Mediocre Results With Facial Rejuvenation? In my last article, I wrote about how practitioners can tap into the unlimited power of positive intent to amplify the results of their treatments. This article discusses a very popular treatment called facial rejuvenation, and why there has sometimes been a wide variance in results and client satisfaction reported by various practitioners offering this service in their practices. Here is a fascinating question: Which of these factors is most significant for healing our patients: 1 the specific clinical techniques we administer, such as insertion of needles into well-chosen acupoints, giving herb formulas, physical therapy, bodywork, and so on; or 2 the healing intent we project while giving treatment? This question has been of great interest to me. Age-related macular degeneration (AMD) is one of the most common forms of vision loss in this country, affecting mainly the elderly. About 12 million Americans have AMD, and that number is expected to escalate to 30 million within the next few years. Patients with AMD gradually lose their vision, with a large black spot covering part of their visual field that progressively gets worse. 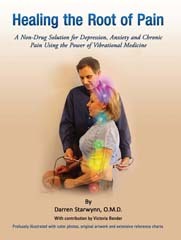 This article is about a simple, yet remarkably effective method to help your patients who are suffering with low back pain (or yourself) This technique is an example of how acupuncture, microcurrent stimulation and physical therapy can be combined advantageously to treat a difficult condition. It is estimated by the National Institutes of Health that 70 percent to 85 percent of all people have back pain at some time in their lives, and that it is the most frequent cause of activity limitation in people younger than 45 years old. RED 1st – Root Muladhara Stimulates liver, sensory nerves & immune system, increases metabolism, resolves scars, benefits bones, reduces chronic constipation, hemmorhoids, speeds circulation/ Ungrounded, inability to manifest, coldness, fear of death ORANGE 2nd – Sacral Svadhishthana Builds and stimulates lungs, thyroid, bones. One modality now generating tremendous excitement among acupuncturists and other health care practitioners is color light therapy. This excitement is due to its remarkable effects at helping to resolve so many challenging and frustrating patient conditions of the body and mind. Color light has been used for healing purposes since the times of ancient Egypt and Greece (or even earlier), and inexpensive modern technologies have made color healing more accessible and more effective than ever. During my years of teaching, I have heard various attitudes expressed about so-called “facial rejuvenation” by my acupuncturist students. The significant profit potential of offering this service seems to be a major motivation for most to want to learn it, yet many also disparage this practice as a cosmetic and rather superficial form of therapy. What really happens when a person shifts from chronic physical or emotional pain to enjoy a new, expanded experience of wholeness? Is it due to a shift in brain chemistry? Is it a change in the body’s bioelectrical patterns? Or is it a spiritual phenomenon? The “heart of healing” is what allows a real shift in the inner, fundamental cause of pain or disease, and includes all of the above. IMPORTANT NOTE – All electrical stimulation devices, including microcurrent stimulators, are are registered with the F D A as “pain control” devices. Stimulators may not be used invasively or labeled as “acupuncture” devices, as this puts them in the category of “experimental” devices which would not be reimburseable by insurance. Those of us who have studied acupuncture have had to deal with massive amounts of often confusing and contradictory information. This includes TCM (traditional Chinese acupuncture), Japanese meridian work, auricular therapy, Korean hand acupuncture, electrical stimulation, hara diagnosis, back shu points, and of course good old symptomatic treatment. Average # of treatments: First patient-5 treatments, second patient-10 treatments. Frequency of treatments: Three times weekly. Physical symptoms: Both patients presented with left Bell’s palsy, the first patient with less than functional strength, and severe left sided facial pain, blurring and tearing of left eye. Application brief #9403-NS-4 submitted by Paula Bell PT, based on one case. Average # of treatments: 16 Frequency of treatments: Twice weekly. Physical symptoms: Shoulder pain. Etiology of injury/condition: Unknown, work related. Method: Four pads, two each shoulder anterior/posterior then moist heat and probe treatment. Average # of treatments: 24 Frequency of treatments: Three times a week. Physical symptoms: Adhered scar, pain, swelling, less strength and range of motion, less functional use of hand. Most patients are three to six months post surgery. Method: Pads on acupuncture points Li 11 –> LI 4, and anterior/posterior wrist joint. Physical symptoms: Patient’s chief complaint was of constant achy pain originating in the central occiput and radiating to the spinous process of C7, also complained of cervical stiffness and muscle spasm in her bilateral cervical paraspinals and levators. Symptoms have been present daily for greater than five years. Average # of treatments: 8 – 10 Frequency of treatments: Two to three times weekly. Etiology of injury/condition: Motor vehicle accident, trauma. Settings used: Acutron Mentor presets Probe #1 and Pad #1 Other therapies: Ultrasound, osseous manipulation, soft tissue manipulation, and massage. The purpose of this article is to provide an overview of the Seven Hermetic Laws that have been recognized throughout human history as a basis of energetic healing and magical practices, and to give practical examples of their remarkably effective applications for acupuncturists. Taking a bit of time to read and consider the timeless truths contained in these laws might help integrate many of your varied, seemingly contradictory aspects of learning and expand your healing abilities. Facial rejuvenation is a highly profitable cash service that has become very popular among American acupuncturists in recent years. This article offers an overview of how low-level electrical stimulation (microcurrent) and customized color light can provide a facial rejuvenation treatment that not only significantly improves the appearance of the face, but promotes good health and vibrant energy as well. The FDA approves electrical stimulation devices for sale in the United States for for “the symptomatic relief of chronic intractable pain and as an adjunctive treatment in the management of post surgical traumatic pain problems. ” Manufacturers of microcurrent and other electrical stim devices are only allowed to advertise and promote their devices for these approved uses. By the time most patients decide to visit an acupuncturist or other CAM practitioner, they are past the acute stage of pain or illness. In fact, most patients visiting us have a history of chronic pain and/or illness that has not been well-alleviated with Western medicine. When a patient tells us they have sacroiliac pain, migraines, knee pain, or a host of other complaints, diagnosis usually reveals a combination of internal and external factors – for example, a 45-year-old woman with recurring hip-SI pain that also has tension in the liver-gallbladder functions, or a man with knee pain in which kidney-adrenal imbalances also show up. The purpose of this article is to introduce a method called PNE balancing therapy, which can be effective in evaluating and treating a wide range of mind-body (psychosomatic) complaints. Every health care practitioner has encountered patients who do not respond favorably to well-chosen treatments. Even after trying several therapeutic approaches, perhaps even referring the patient to other professionals, there is no substantive improvement.